ATTN!!! THIS CONDO WAS JUST REMODELED FOR THE 2018 SEASON! La Mirage is a set of two private 4-story condominium bldgs on Ocean Blvd. La Mirage has a year round indoor swimming pool that has sliding doors and opens up on all 4 sides during the summer season. From our condo, you're within walking distance to a few great restaurants such as Damon's on the Beach, Texas Roadhouse and less than two miles from Market Common where you'll shop several Charleston style boutiques, eat at many famous restaurants, and find great entertainment for all ages! 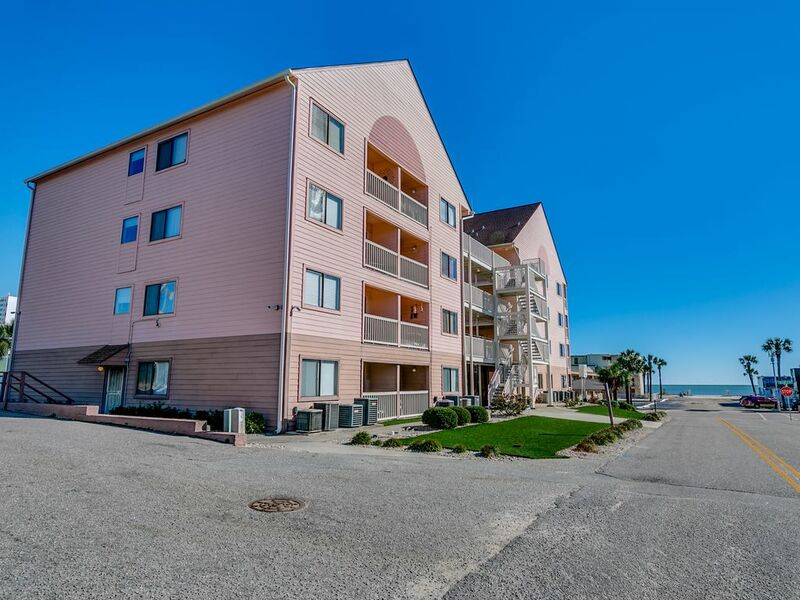 We have the first floor corner condo which is perfectly set to stare directly across the street at the Atlantic Ocean just beyond the beach front public access way! Our non-smoking Condo has a full size eat-in newly remodeled kitchen, new TVs in the bedroom and living room. Wall to wall luxury tile flooring throughout and our balcony hugs S. Ocean Blvd with a view of the beach directly across the street! Just a few blocks away from PAR 3 GOLF, PUTT-PUTT, HELICOPTER RIDES, PARKS, FISHING PIERS and the MYRTLE BEACH STATE PARK! Just across the street approximately 30 yards to the beach! Check out the fabulous views from our first floor balcony! Ok, but noisy and need an update for the fridge and dishwasher. We had a great vacation in Myrtle Beach. Beautiful distance from the beach, nice pool, close parking, clean condo on our arrival, a quiet corner in Myrtle, not a lot of shops nearby. As for your condo, there are many things to improve for the price we pay. The pictures of the condo that you provide are really more beautiful than reality. The bed that is described by someone else in the previous reviews is really too soft with the foam mattress you added on top. The refrigerator and the dishwasher are broken and it's unpleasant to put the shelf of the non-standard fridge up and bickering with the bottom of the dishwasher every time we open it. The dryer is really noisy and no doors to mute the sound in the bedroom. It is definitely missing utensils (4 bread knives, 3 teaspoons and 4 large spoons, the forks are ok). For future visitors, know that the air conditioning system is three feet from your feets in the bed and it is noisy a bit to sleep. It's a wooden building and the people on top of us were noisy. We do not know very well where to put the bins, there is no info on it and it is not easy to find them. Very tight space in the room, the rest is fine. For people that noise does not bother them its fine. For others, bring your earplugs. Thank you John for your condo, but you should spend a week in high season to really know what I'm talking about. Another great year at LaMirage... looking forward to next year.